The components promote the sharing and localization of knowledge, and are directly related to the classification scheme by theme. Users can use an existing axis to classify their questions. 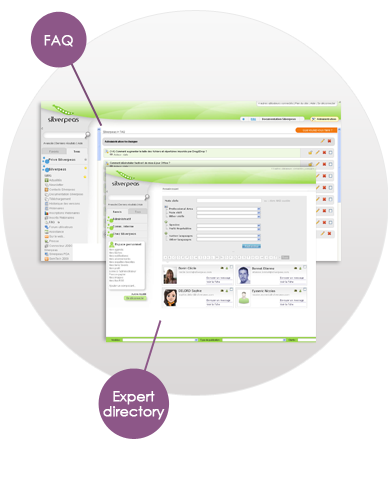 Users identified as competent experts on themes, receive notifications and can publish their answers. The knowledge base can be consulted by readers with read rights. Component animators are in charge of closing and moving exchanges. The knowledge base component allows the FAQ tree structure to be organised by theme. FAQ can be accessed via the tree structre or the search engine. The components' settings can be adjusted using a simple administration interface needing only basic IT skills. The Experts directory allows employees to be classified according to their skills, in association with classification plan. Experts are immediately identified and localized.